March 19th is quickly approaching. To most that is simply another day. For me, it’s my due date. If this birth is anything like my others, the baby will be born pretty close to that date. My first baby was born 2 days after her due date, our oldest two 2 or 3 days before his due date, and our youngest son was born on his due date. Any guesses when this baby will be born? You would think with this being # 4, I’d be prepared and ready to go by now. I’m not. I actually haven’t done much. I keep thinking I have all this time. But March is quickly approaching. It is time to get ready for this baby to come. How are we preparing for a baby girl? Reread our books on birthing and labor. Sure I’ve done it before, okay three times, but I still need a little refresher course. Every time I read those books, I find new gems. I also make my husband read sections of the books. He doesn’t read the whole thing, but I highlight the key points for him. Find a doula. We had a doula for our first and third births. Our second just got a birth photographer. Having a doula there to help take the pressure off your husband makes a world of difference. With our first birth, labor was LONG. My husband got hungry. Having a doula there allowed him time to leave and grab a bite to eat, and I wasn’t left alone. With our third, having a doula there was important because she knew what I wanted and didn’t want for my delivery. Baby #3 was almost born in the lobby of the hospital, and my husband was parking the car. I was so thankful the doula was there as my support person! Research Essential Oils for Labor, Delivery, and Postpartum. It’s no surprise I’ve fallen in love with Young Living Essential Oils. We pretty much use them for everything. I’ve been using lemon essential oil in my water to help with water retention. I can tell a big difference when I use it and when I don’t. I also used YL’s Gentle Baby blend and Lavender essential oil to help stop preterm labor during the snow storm. Making freezer meals for after the baby is here. I need to get on this one. I would love to stock our freezer with meals so I don’t have to think about dinner after the baby is born. We don’t have family in the area, so we’ll probably have visitors for a couple of weeks, and then it will just be me and four children 5 and under. Life is already chaotic. Having one less thing to worry about would be amazing! Make Scripture cards. Maybe if I do it now, it will get done. I want to make cards that have Scripture on them that I can meditate on during labor. I’ll probably also make a playlist of calming songs with Scripture. Our last birth I used Hidden in My Heart. Loved it! At least until I got close to transition. Then I can’t stand anything that has words. Words make my skin crawl and I want to throw things. But that means I’m nearing the end! Make a birth plan. I made a birth plan with our first birth. I’ve pretty much just used the same one with slight changes for my subsequent births. Like for # 2 we had a birth photographer so I had to write that in. Then for # 3, we had my placenta encapsulated, so that was in there. If you do make a birth plan, make sure you make multiple copies. One for your doctor, one for your medical file. I also make sure to take at least two copies with me in my hospital bag. Pack the hospital bag. While for our first birth I had the bag packed long before we needed it, the next two times, my husband was throwing things in a bag while I was laboring. This time I’d like to at least have the basics packed before my due date. We’ll see what happens. Install the car seat. We won’t do this until March, but we at least have a new one. Unfortunately, our other one expired. But we did use it for three babies. I’d say we got our monies worth out of that seat! Organize the house. My nesting is in full force. I have gone through all the toys. I cleaned and cleared out the sippy cup cabinet. I took every off the front of the refrigerator. I cleared off the top of the refrigerator. I’m thinning out the furniture, and the decorations. If I had to choose one word to describe this cleaning and organization frenzy, I would call it “Simplifying.” Clutter is driving me crazy, so we’re going back to the basics. I’m sure my preparation list will grow as we get closer to March. All my to-do lists tend to grow until they take on a life of their own. But this is a great place to start! At least we’ve already registered for some basic items!! 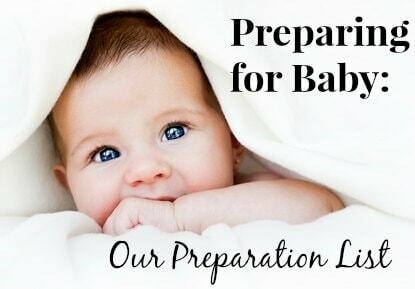 How do you prepare for baby? What would you add to this list? I just had my 4th baby March 7th of last year. Get ready 4 is wonderfully busy 🙂 I do YL essential oils too and love them! Great tips! I feel like we just had baby #2, but she is 8 months now. Thanks for all the great information. Whitney – I’m launching a book very soon on this same topic! Would you like to join the launch team? You get a free copy of the book, prayer cards, nursery wall art and nursery planner and you can become an affiliate making 50%. Here is some info: draft launch page: http://www.happyandblessedhome.com/baby-ready, google sign up form: https://docs.google.com/forms/d/1HhWxT34ei_JTku91YtznViG2iVHKq1aYCnOaGJUCdKk/viewform Would love to have you!